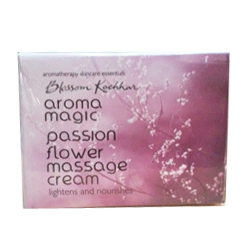 Buy Aroma Magic Passion Flower Massage Cream Relax & Ease Muscle Tension, Deep Nourishing Skin, Lighter & Brighter Complexion. Relax and ease muscle tension while deeply nourishing your skin. 100% free of petrochemicals, phthalates, toxic ingredients, artificial colouring and frafrances. A multi benefit massage cream packed with the goodness of PRO Vitamin B5, avocado oil and the passion flower seed oil which is rich in vitamins, phosphorus and calcium. Together they relax and ease muscle tension while deeply nourishing your skin. The blend of lilly of the valley and lavender essentital oils helps to calm and delight rich antioxidants combine to leave you with a lighter and brighter complexion. Apply the cream onto the skin and massage gently. Wipe away any excess cream after the massage with a damp cotton. Aqua, Olea Europaea Butter, Aloe Barbadensis Gel, Persea Gratissima Oil, Capejasmine Fruit Extract, Passiflora Incarnata Seed Oil, Pyrus Malus Extract, Citrus Aurantifolia Extract, Lavandula Angustifolia Essential Oil, Convallaria Majalis Essential Oil, Tocopherol Rich Extract Vitamin E.